Bio: Destro is the faceless power behind M.A.R.S. (Military Armaments Research System), largest manufacturer of state-of-the-art weaponry. To Destro, war is man's most natural state: the fittest survive and the greatest technological advances are made. He maintains a luxurious lifestyle around the world. Destro provides high-tech arms to any side able to meet his price and will incite war where it does not exist. He dons his silver battle mask (a Family tradition) and enters battle himself, either with Cobra (Destro is their major weapons supplier) or against them if it's better for business. Comments: Destro respects the G.I. Joe team for their combat skills and expertise, but abhors them for wasting such skills to maintain peace. He's totally dedicated to seeing them undermined, subverted, or destroyed! This Destro figure is part of the G.I. JOE 25th Anniversary Cobra Set. 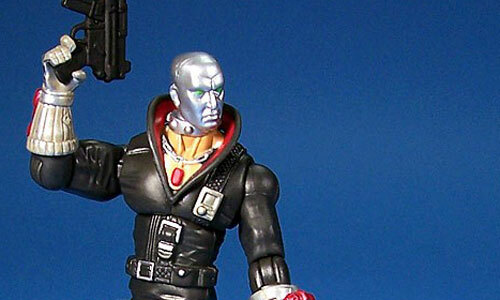 This Destro figure was re-released on a single card as part of wave 4.